Our SWOT challenge was designed to give entrepreneurs a look at their business. Once you have completed your SWOT analysis, here's how to proceed. Welcome to the final day of our 5 Day SWOT Analysis Challenge! Invite others to take the challenge! Share this article on Facebook or Twitter and use the #SWOT hashtag. By conducting a SWOT analysis of your business, you’re starting your year off right. Our 5 Day SWOT challenge was designed to give entrepreneurs a big-picture look at their business. Now, the strategic planning starts. You’ll use this list to create strategies to improve your business. We’ll walk you through how to turn your analysis into actionable strategies today. That’s the last step in your SWOT journey. When you’re done, you’ll have the information you need to make key business decisions now and in the future. If you just learned about our 5 Day SWOT challenge, check out these four links to bring your business up to speed. Before we dive into today’s task, let’s make sure your SWOT analysis is ready to go. All information should be on your template. At the beginning of the challenge, you probably downloaded this foursquare template. All of your information should be here. If you need a template, download it now and transfer your information to it. It’s easier to read and understand if it’s in this format rather than on separate pieces of paper or computer files. Look at other examples. If you haven’t done so already, take a look at a few completed SWOT reports so you know what yours should look like. Here are a few SWOT examples you can look at. Use bullet points. Everything listed in your analysis should be in a bulleted format. You don’t need complete sentences. Boil down each point. Each bullet point should be short—a few words will do. If you need to, simplify your points. Refine your information. If you came up with a healthy list for each of your strengths, weaknesses, opportunities, and threats, it’s time to refine the information. Check for redundancies, combine bullets where necessary, and eliminate any information that isn’t vital. Prioritize your information. It’s time to go through each section and rank the information. Put the most important or pressing item on top of each square. A list of strengths, weaknesses, opportunities, and threats makes for a handy business guide, but you’ll want to take this exercise one step further to create strategies and plans to improve your business. Strengths–Opportunities. Use your internal strengths to take advantage of opportunities. Strengths-Threats. Use your strengths to minimize threats. Weaknesses-Opportunities. Improve weaknesses by taking advantage of opportunities. Weaknesses-Threats. Work to eliminate weaknesses to avoid threats. The chart below is a great visual explanation of this exercise. As you answer these questions, you’ll start to create actionable strategies. For example, if one of your strengths is an experienced grant writer on your team, you should put that person in charge of taking advantage of new federal grant opportunities that are available this year. That’s a strategy that you can implement immediately to improve your business. 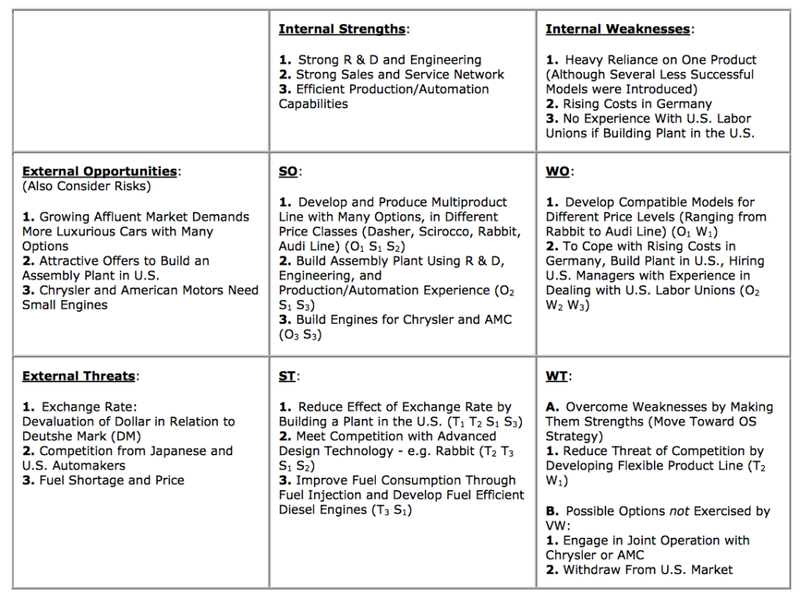 You can simply add a few blocks to your SWOT analysis to get these strategies down on paper. Here’s an example of a completed TOWS analysis from the University of San Francisco, which shows a TOWS analysis for Volkswagen. It shows you what the exercise looks like and gives you an idea of the strategies that can come from this analysis. When you’re finished with the SWOT and TOWS analysis, you’ll have an insightful look at your business that’s accompanied by a list of strategies that you can implement to better your business. Take this list of strategies and start implementing them. If some strategies are long-term plans, break them into steps and put each one on your calendar so you can implement the change over time. Now that you have this business resource, you’ll want to keep it handy. Hang it on your office wall, or keep it on your desktop so you can reference it throughout the year as you make decisions. Improved focus. This analysis should put everyone on the same page. It identifies what you should be working toward this year. Conversation starters. With everyone working on the same goals, managers and employees can continue to build strategies. Identify unknown aspects. You’ll likely discover aspects of your business that you didn’t know about. From unknown strengths to hidden threats, uncovering this information will help you move forward. Strategies for success. Above all else, you walk away with strategies to help your business. If you are one of the many business owners who set aside time this week to participate in our challenge, we’d like to congratulate you. You have made great strides toward improving your business in the 2015. We’d love to hear how the process went for you. What did you learn? How will your SWOT analysis help you make effective business decisions? Share your thoughts in the comment section below, or on Twitter.